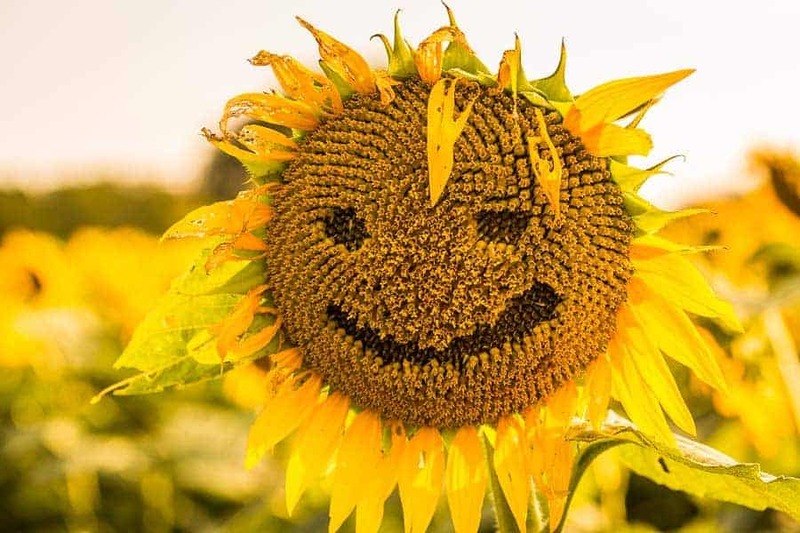 If you ever happen to be traveling through eastern Kansas in late August or early September, take a little side trip to Grinter's Sunflower Farm. If your timing is right, you will get a visual treat and an opportunity to make some really nice images. Most people think of Kansas as a flat and boring state. One to be passed through quickly or avoided altogether. I would have to disagree. There is much beauty in the hills, the range land, and the farms that dot the state. This little area located off the beaten path between Lawrence and Tonganoxie is no exception. 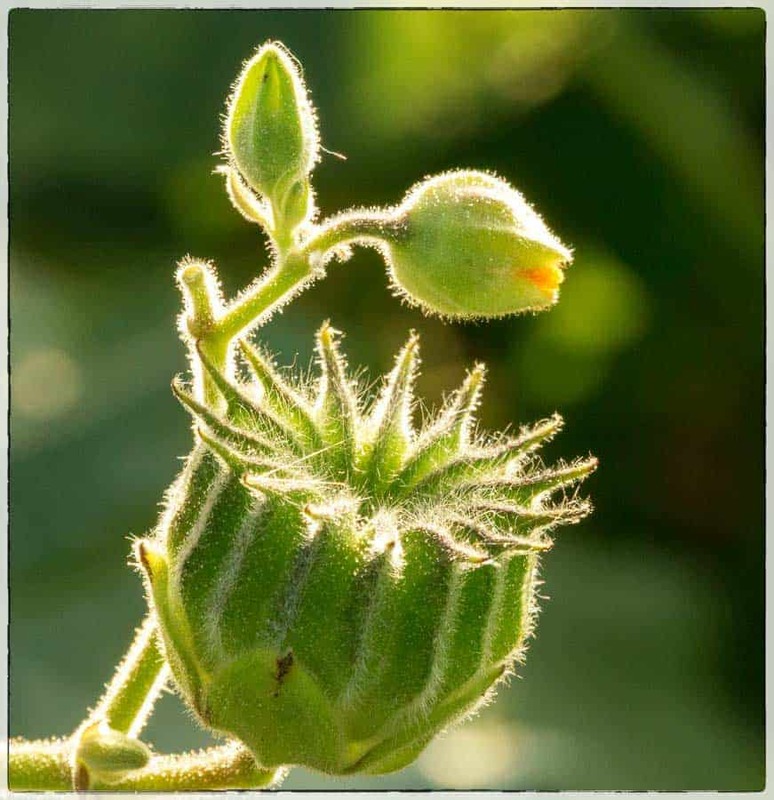 There are a few things you need to know about Grinter's Sunflower Farm before you visit. This article will provide some valuable information and tips to help you make some amazing images while you are there. 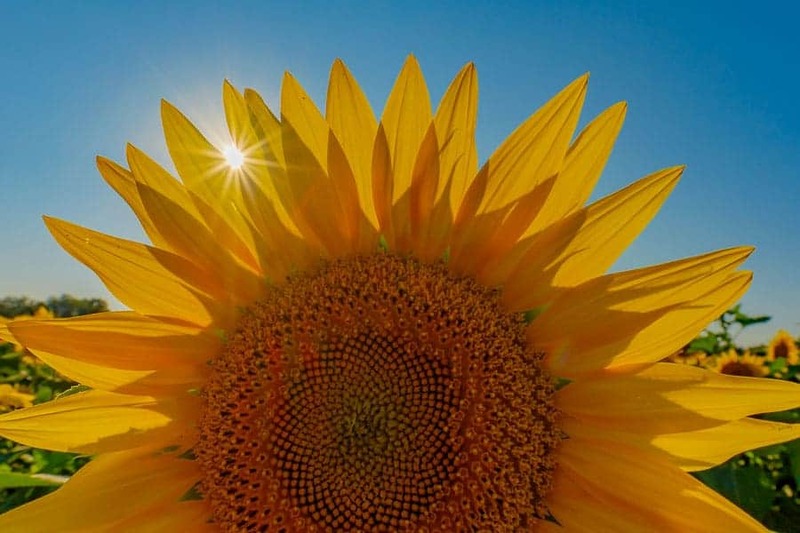 Sunflower with sunburst. Photo by Rusty Parkhurst. We recently released a new iPhone/iPad app that has thousands of the best photo locations around the world all in one app. It' s a free app called Really Good Photo Spots and you can download it right here. Grinter's is in the app, but also there are MANY THOUSANDS more in the app. It's a must-have for travelers and photographers. We've already established that the farm is located in eastern Kansas. If you type Ted Grinter's Sunflower Field into Google Maps, you'll see exactly where it is. It is easy to find and is not far off Interstate 70, which is the main highway running east-west through the state. The farm is just off US Highway 40, approximately 8 miles northeast of Lawrence or 6 miles southwest of Tonganoxie. You turn off of the highway onto Stillwell Road, which is gravel, to get to the fields. There is usually ample parking either along the road or in a number of pastures that are temporarily converted to parking areas. Expect to see lots of people. 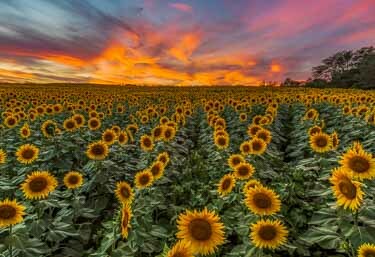 Sunflower fields are nothing new to Kansas. 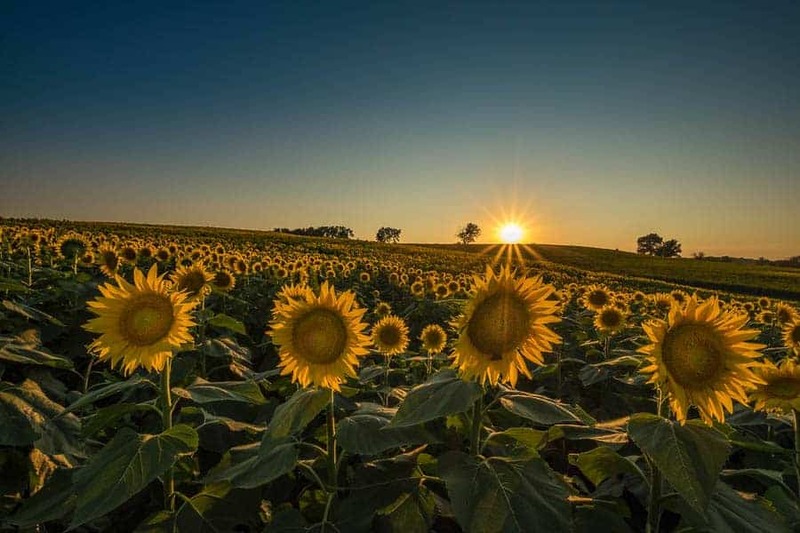 In fact, the sunflower is the state flower of Kansas. They have been around a while, and people have admired them for some time. Grinter Farms is perhaps the most spectacular and most easily accessible from the larger cities in Missouri and Kansas. Each year, approximately 40 acres of sunflowers are planted. That is a total of one million sunflowers. During the peak, the field is a sea of yellow and is a really amazing sight. It's no wonder that it has become such a popular late summer destination for the general public and especially photographers. I've visited this place the last three years and have witnessed the amazing growth in popularity. It has become a popular location for photographers of all skill levels for senior or family portrait shoots or to create some unique landscape images. This is where it gets a little tricky. The best time to go is not only slightly different each year, the window of opportunity is also narrow. The sunflowers are typically planted in July, but that can vary based on weather and other factors. This means that the flowers usually bloom in late August or early September. Peak bloom time for sunflowers is relatively short, with two weeks generally the max. This can also vary, and late summer storms could really damage the flowers. With some careful planning and flexibility in schedule, it shouldn't be too difficult to get to the fields during the peak season. The Grinter Farms Facebook Page is a good resource to find out the field conditions and the predicted peak. The best light will usually be early morning or late evening. Photo by Rusty Parkhurst. This year (2016), the peak happened to fall on Labor Day weekend. That, coupled with the increasing popularity of the farm, created some issues due to overcrowding. 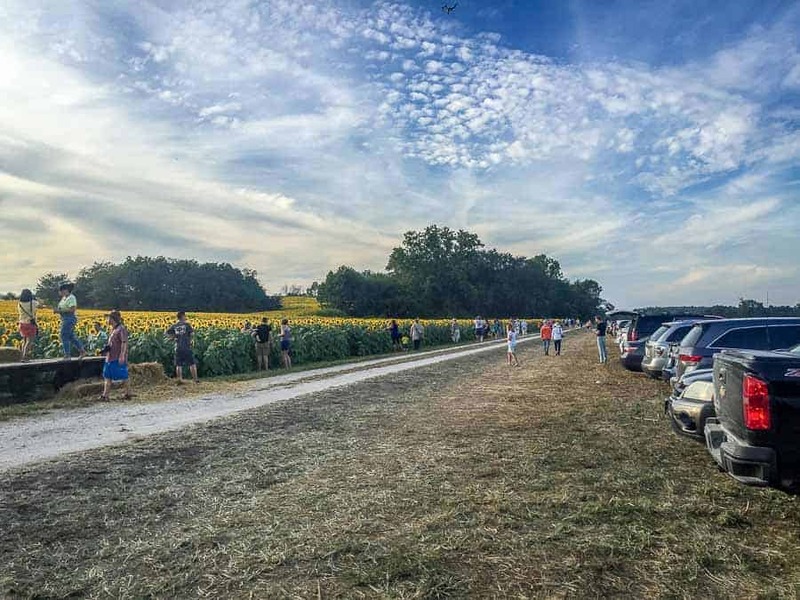 Some estimates indicated that the farm had as many as 70,000 visitors between the Thursday before and Labor Day. At one point, it had to be shut down temporarily to alleviate extreme traffic congestion on the incoming highways. By contrast, there were an estimated 30,000 visitors during the 2015 season. In other words, more and more people are discovering this place. My recommendation is to avoid the holiday and weekends, if at all possible. Besides the time of year, the obvious best time to go for photography is early morning or late evening. The best light for landscape photos is typically during these times. There are a couple of advantages to going at these times. 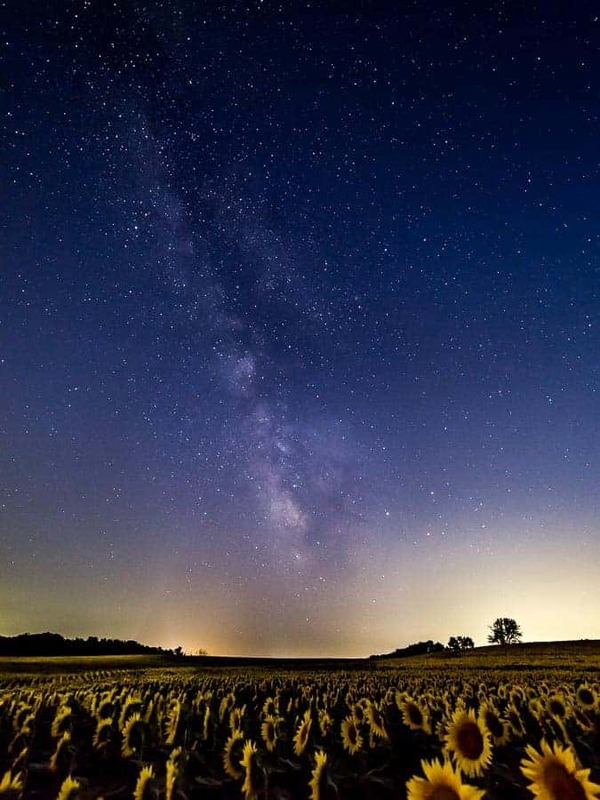 Fewer people will be there in the early morning hours, and if you go in the evening, stay until after dark for some possible shots of the Milky Way over the sunflower field. Stay late for some Milky Way shots. Photo by Rusty Parkhurst. The gear you need will depend a lot on what you intend to shoot, but I'll assume mostly landscape images for this article. Most any camera will work, but DSLRs or mirrorless cameras will generally provide the best image quality. An assortment of lenses may be a good idea, but keep in mind that you will be in the middle of a farm field, which could make changing them a risky proposition. If you do change lenses out in the wild, do so as quickly as possible, block the wind as much as yo u can with your body, and keep the open camera body pointed downward to minimize things getting in there. Another thing that has worked for me is to carry plastic bag large enough to fit your camera, lens, and your hands. Changing lens inside the bag will help reduce the amount of dust particles that could get into your sensor. A wide angle lens will be good for the sweeping landscape images that take in all or most of the field and the surrounding environment. 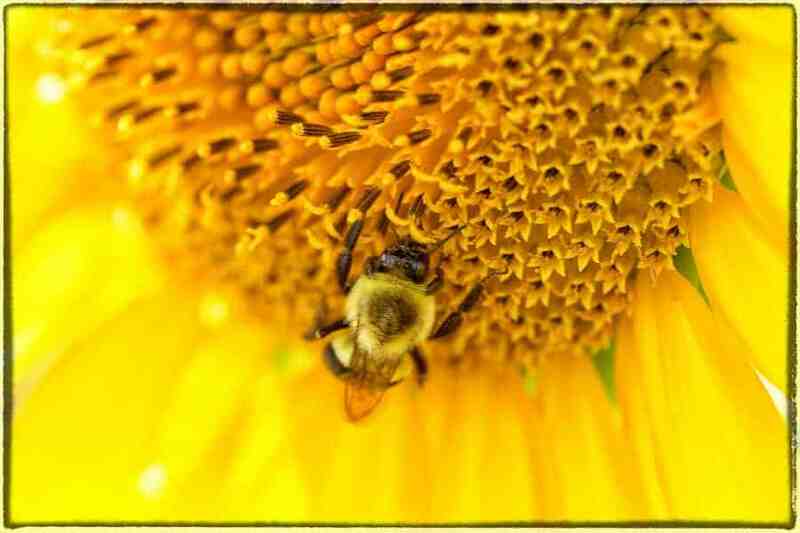 However, you may want a telephoto lens as well for the ability to zoom in on a single sunflower or group of sunflowers. Getting in close to show some details will help to tell even more of the story. For this, you might want a macro lens or extension tubes to use with your normal lens. Bring along a tripod as well. Whether shooting in the early morning or late evening hours, there isn't a lot of ambient light and you may need slower shutter speeds than what can be hand-held. Although you could raise the ISO, it is best to keep it as low as possible for the best quality image. If you plan to do any night photography, then a tripod is a must. You will also want a headlamp to see where you are walking and to have your hands free to make camera and tripod adjustments in the dark. Insect repellent. I neglected to take this on my last visit and regretted it all evening. My plan was to stay after dark to shoot the Milky Way and I was nearly carried away by the mosquitoes. Also, make sure to dress appropriately. Walking through a field of sunflowers is not comfortable in shorts. Long pants and even a long-sleeve shirt is best. If there is lots of sun, bring along a hat as well, since there isn't any shade out in the field. Grinter Farms call these the “Rules of Engagement”, and are some things that need to be considered before visiting. They are mostly common sense, and the idea is to keep the farm and the field at its best and provide the best experience for all visitors. There is no charge to go to the farm, to park, and to take all the pictures you want. You can even cut and take home a flower or two if you'd like. However, there are donation boxes to help support the farm and to keep it going. The most important thing is to be considerate of others. This place gets crowded. There will be lots of people. You are free to wander the 40 acre field to find the best shots, but there may be people in your images. It's generally not a problem to remove them in Photoshop. Leave nothing behind except footprints, and keep in mind that others will be there after you leave to see this sight. I've seen rows of sunflowers needlessly trampled. If it is muddy, don't even try to go. Leaving ruts in the parking lots is not good and walking through a muddy field will not be a fun time. Wait for things to dry out. I hope this has been helpful and that you will consider a stop at Grinter Farms if you happen to be in the area in late summer. If you do happen to be in the area and would like to visit, feel free to send me a note and I'd be happy to show you around.